Box of safety matches manufactured for the Panama Canal Company. The Panama Canal is a 48 mile ship canal that connects the Atlantic Ocean (via the Caribbean Sea) to the Pacific Ocean. It cuts across the Isthmus of Panama and is a key conduit for international maritime trade. One of the largest and most difficult engineering projects ever undertaken, the Panama Canal shortcut made it possible for ships to travel between the Atlantic and Pacific Oceans in half the time previously required. Construction of the canal was initially started by France, but the project was abandoned. In 1904, the United States, under President Theodore Roosevelt, acquired the project and commenced operations to construct the canal where the French had failed. It took a decade, but the Canal was completed and the put into operation in August of 1914. 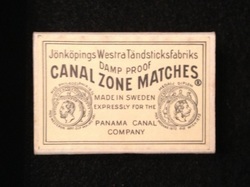 Box of matches in the collection are labeled as “Damp Proof Canal Zone Matches", and are further identified as having been manufactured by Jönköpings Westra Tändsticksfabriks, and that they were made in Sweden expressly for the Panama Canal Company.